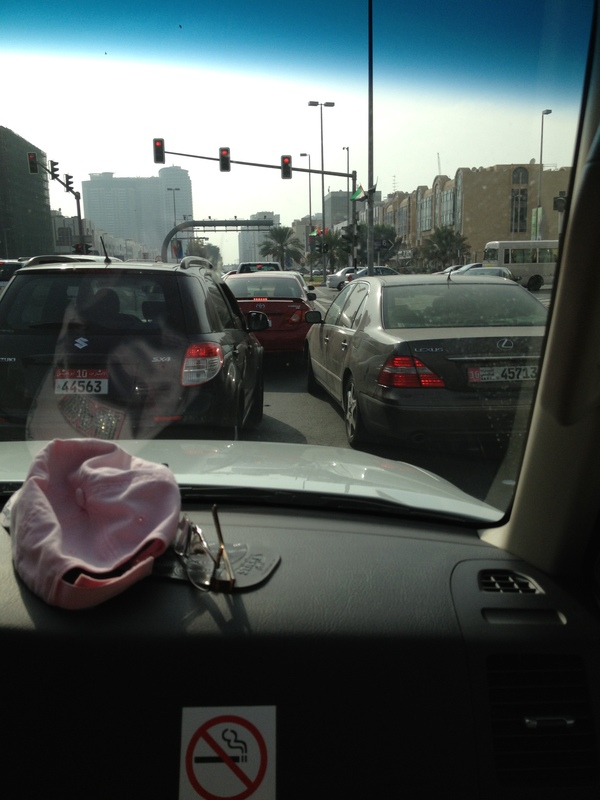 A friend in Dubai used the phrase “going native” with me as we were driving around….. see, the apparent custom here is that if you’re sitting behind another car in traffic at a traffic light and it turns green, the first one to honk wins. Apparently. So, as the light in front of us turned green, I said “honk”. She cracked up and said “so you’ve been here long enough to be going all native on us, huh?” Made me laugh. I was navigating. Normally, not an issue…. But I’d missed an exit a week or so before because it looked like a construction site entrance, and we ended up having to drive about an additional 30 minutes because I’d missed it. So this time, that exit that looked like a construction entrance wasn’t gonna fool me….. right off a 7-lane expressway…… uh yeah, I was certain it was our exit. *sigh* It wasn’t. TBG didn’t fuss, he just started looking around to figure out how to get us out of this construction area….. found a bit of a road in the right direction and headed out. But the road was getting narrower and narrower and narrower…… and was now separated from the main highway, but adjacent, but now… it… ended. Sand. No pavement. Hmmm…. We’re less than 20’ from the shoulder of the road we shoulda been on with only flat fairly smooth sand between us and it… you guessed it, there he went! Crazy, but he got us there! A bit later, some big FJ was trying to crowd us out of our lane, kept easing over and easing over…. Normally, they’d have had that spot, no problem. But we needed to move over a couple lanes and exit pretty quick, so no joy for him! Honking and flashing did that driver no good, TBG wasn’t moving to the left to let him around on the right, as we needed to exit. So the FJ ended up somewhere a few cars behind us, TBG did a “Dubai Slide” over a couple two or three lanes, and we made our exit. Ba-da-bing! On the way to eat supper and then to the grocery, our four lanes quickly change to three with no signs or indications…. The road just has no stripes any longer, leaving drivers to attempt to sort out what’s happening till the stripes resume… but with only three lanes now. Oddly, there were three cabs in the lanes adjacent to us, and they tend to drive with some serious abandon here…. But when the dust settled and the stripes reappeared, those cabs were behind TBG, cause our supper stop was just ahead! I think I noticed one of the cabbies grumbling to himself. As always, there’s someone that doesn’t want to wait in the line of traffic, their business is ever so much more important than yours. They’ll drive along the shoulder, or in a turn lane, or in the lane where cars park, or a fire lane, or a merging lane until it’s no longer possible to go, and they expect someone to let them in. And if there’s more than a 2 cm gap (about an inch) between you and the car in front of you, they’ll attempt to wedge themselves right in there. That “someone” wasn’t gonna be TBG that day. Parking garages tend to be a huge free-for-all. Really. Parking spaces in Dubai are insanely hard to come by sometimes, and when people think they’ve seen someone heading towards their car, they’ll come to a dead stop and wait. And wait. And honk. And wait. Parking garages are insanely loud places, the honking echoes many times. Crazy. Normally, we’ll just pull out around the waiting car and drive on, there’s likely another spot somewhere. This parking garage had the red/green lights over each parking space to indicate occupied or open. If you’re looking down a quarter-mile of parked cars, those little lights REALLY help! TBG saw a green one and headed down the aisle….. sadly, against the arrows. Going the wrong way. Unlike others, he didn’t stop and back up, he just continued unabashedly down to the open spot. And parked. TBG had gone native, y’all! !